Last year the Bureau of Labor Statistics released the results of a time use survey, conducted to shed light on how the average American spent his or her day. Would you be surprised to know that on “food preparation and cleanup” we spend just a little over half an hour a day – on all three meals combined? As busy as we all are, we still enjoy the satisfaction of a simple home-cooked meal. But who has time? We asked our Springs Apartments leasing teams to gather their favorite quick dinner recipes to share with our residents and other readers. 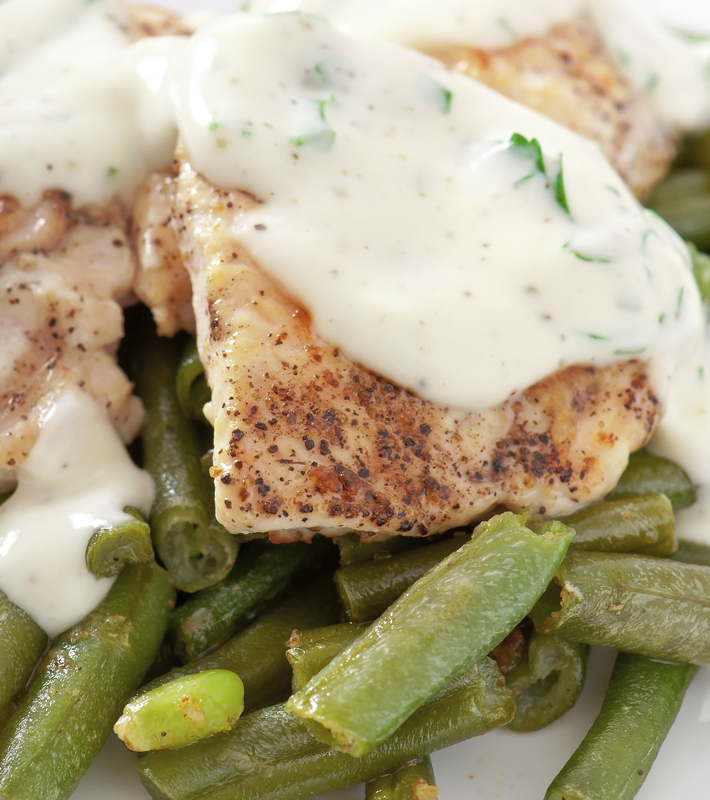 Elegant, delicious, and ideal served with a hearty side salad or pasta and vegetables. Place each chicken breast half between two pieces of plastic wrap. With a rolling pin, meat mallet or heavy saucepan, lightly pound chicken to 1/4- to 1/8-inch thickness. Discard plastic wrap. In a shallow dish combine flour and pepper; place chicken in mixture and dust sides thoroughly. In a large skillet melt butter over medium heat; add chicken. Cook about 6 minutes or until no pink remains in the chicken, turning once. Transfer chicken to a platter, reserving drippings in skillet. Cover to keep warm. For sauce, add onion to the drippings in the skillet; cook and stir over medium heat for 1 to 2 minutes or until tender. Stir in cream, white wine, and mustard. Cook and stir for 1 to 2 minutes or until smooth and slightly thickened. Spoon sauce over chicken. If desired, snip fresh thyme to sprinkle over chicken and garnish with thyme sprigs. Serve with pasta and cooked vegetables for a complete, delicious meal. 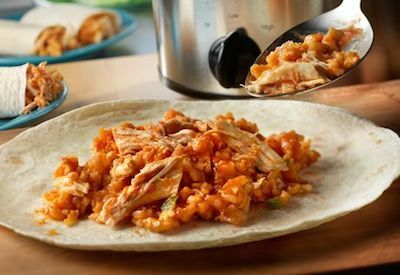 This cheesy chicken and rice filling has just the right touch of spice – enough for adults, not too much for kids. Leftovers freeze well, so think about making a double batch so you have a second meal. Stir the soup, water, picante sauce and rice in a 4-quart slow cooker. Add the chicken and turn to coat. Cover and cook on low for 7 to 8 hours or until the chicken is cooked through. Remove the chicken and place on a cutting board. Using 2 forks, shred the chicken. Return the chicken to the cooker and stir. Spoon about 1 cup chicken mixture down the center of each tortilla. Fold the tortillas around the filling. The best thing about this recipe might just be the fact that you don’t have to cook the pasta separately – it cooks along with all the other ingredients, making this Italian dish fast and fabulous! 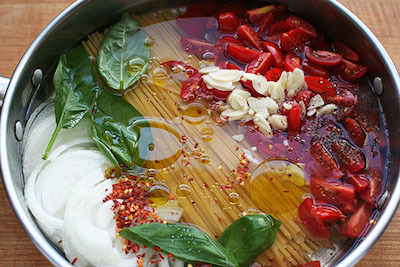 Combine pasta, tomatoes, onion, garlic, red pepper flakes, basil, oil, 2 teaspoons salt, pepper, and water in a large straight-sided skillet. Bring to a boil over high heat. Boil mixture, stirring and turning pasta frequently with tongs, until pasta is al dente and water has nearly evaporated, about 9 minutes. Season to taste with salt and pepper; divide among 4 bowls and garnish with basil. Top with a dusting of Parmesan cheese. This quick recipe is made using a muffin tin to create individual enchilada cups – kids love ‘em, and cleanup is a breeze! Reheat for a great brown bag lunch at work. Heat oven to 350°F. Press tortillas into the bottoms and up the sides of 12 muffin-pan cups. Stir the soup, sour cream, picante sauce, chili powder, chicken and cheese in a medium bowl. 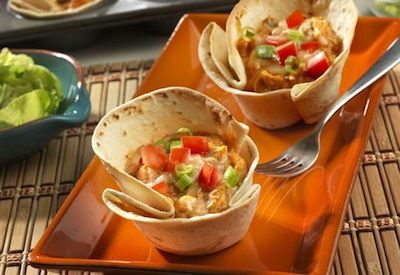 Divide the chicken mixture among the tortilla cups. Bake for 20 minutes or until the chicken mixture is hot and bubbling. Sprinkle with additional cheese, if desired. Let the enchilada cups cool in the pan on a wire rack for 5 minutes. Top with the tomato before serving, if desired. We’d love to share your time-saving, hunger-busting recipes with our residents and readers – what’s your “go-to” dinner when time is short but a frozen pizza just won’t cut it?